Following the expansion of its flagship family of G6 and the launch of a new line of smartphones Q series LG has set the date of the next presentation – August 31, 2017, the day before the opening of IFA 2017 in Berlin. 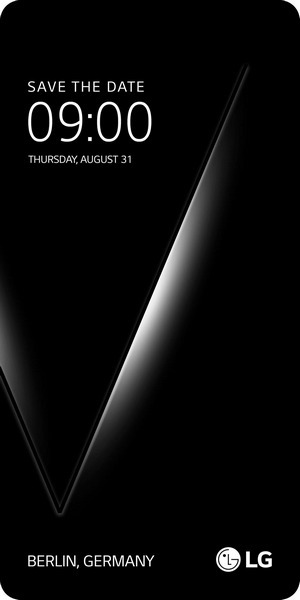 The name of the upcoming new items not mentioned anywhere, but the silhouette of a smartphone with the letter V hinted that the main intrigue of the event will be a big LG V30. LG V30 originally was supposed to be a slider with two displays, but after the failure of the “modular» the LG G5 Reputation: the manufacturer has decided to postpone the bold experiments with the design to better times. If you believe video renderam OnLeaks, it looks like a smartphone LG G6 and differs only in the design of dual camera module and the display size. The original published teaser has dimensions 2880 x 1440 pixels and aspect ratio of 2: 1, thus, Full Vision display narrow limits can be considered confirmed. Rumors about OLED-repeat panel with a diagonal of about 6 inches, which will occupy most of the front panel. LG V30 also credited top chipset Snapdragon 835 6 GB GB 64/128 and internal memory, the body of glass and metal, as well as the DAC Hi-Fi Quad. The predecessor of LG V20 is the first smartphone with Android 7.0 Nougat out of the box, and the new model can get the Android 8.0. Insiders add that the LG V30 will appear in Europe, while the V20 was officially available in the US and in Asia. The price of the smartphone information yet. This entry was posted in NEWS AND REVIEWS and tagged LG V30 makes its debut at IFA 2017 and will be sold in Europe. Bookmark the permalink.